Gravy sometimes is overlooked during the cooking process but it is the unsung hero of holiday meals. You do it right and no one thinks about it. You do it wrong and everyone is disappointed. This smooth giblet gravy makes everything better, from the turkey to the cornbread dressing (recipe) to the mashed potatoes. This is a recipe that was passed down from my wonderful mother, Betty. Hope you enjoy. And make sure to check out my other Thanksgiving recipes. Header image via Angie’s Southern Kitchen and used in accordance with the Creative Common license agreement. 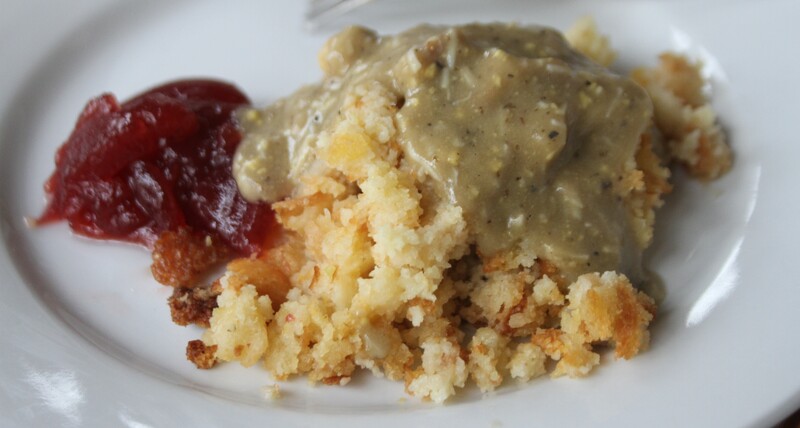 Thanksgiving turkey isn’t complete without moist, yummy cornbread dressing. It’s taken me years to get this one right, so I’ll share my experience with you. This is her cornbread dressing, which I like topped with a splash of smooth turkey giblet gravy (recipe). It’s also fabulous to slice thinly onto leftover turkey sandwiches with homemade mayonnaise (recipe) and a sliver of cranberry sauce (easy recipe). Goodness, my mouth waters just thinking about it. Some years ago, Mississippi’s Jill Conner Browne wrote a series of hilarious books based on her “Sweet Potato Queen” stories and philosophies of Southern culture. Fortunately, she also offered a recipe for said-named casserole, which I’ve expropriated and adapted through the years because my daughter likes it so much. It’s now a staple of our Thanksgiving feast and equally delicious leftovers. That’s why I usually make two casseroles – one for the midday meal and another for later. You will love it, and it couldn’t be much easier. It’s a nice, fluffy, modern “company” side dish that I think is far superior to grandma’s marshmallow-topped version. You will appreciate it even more, if you read Jill’s books. Header image via louisianasweetpotatoes.wordpress.com and used in accordance with the Creative Commons user agreement. We’re planning our Thanksgiving menu. Are you? Holiday alert! The Southfacin’ Cook will begin soon with some fabulous ideas and tips for your holiday table. This week, please go out and buy your sweet potatoes in anticipation of my “Sweet Potato Queens Casserole” recipe. Sweet potatoes need to chill in the refrigerator a couple of weeks before you cook them so they increase in sugar content. I’ve already got mine there. As for how many to buy, figure one large tater for every two servings. I mean “large,” too. I look for potatoes about the same size so that they will bake across the same time. Baking is the best way to go because it also maximizes the sugar content. Watch for my cooking lesson and recipe in a couple of weeks. We’ll cover the sweet potato casserole, the turkey, gravy, cornbread dressing and more. Header image via flickr user Nick Bastian. My father didn’t do much cooking. Chiefly, he’s remembered for accidentally setting fire to the kitchen while trying to cook bacon and watch the World Series simultaneously. We’ve never been much for multi-tasking. But the man could make a really good pound cake – dense, crusty, delicious. Where he got his recipe is unknown to me, but lately I found one very much like it in my mother’s recipe box. It was an old, brown newspaper clipping taped to a file card. It is beyond delicious! It’s tall and just the right density, and so buttery. You will love it, and your guests will think you are the greatest baker ever.